There are three things that Boogie Monsters are known for: being terrifying, having massive hoards of treasure, and partying. Click here to play! When they're on the clock, it's all about terror. When they're off the clock, though, Boogie Monsters like to get down and party. You've been invited to the ghoulest Boogie Monster party around, with all the big name monsters in attendance. Aside from all of the painfully stylish skeletons walking around, there are also tentacle monsters, mummies, zombies, witches, living scarecrows, The Wolf Man, and of course, the King of Boogie Monsters. The local vampire has also been seen flying around as a bat - as if remaining in bat form will hide that he's put on weight! It's not as if all the monsters haven't seen his pictures in the Ghoulish Gazetteer. 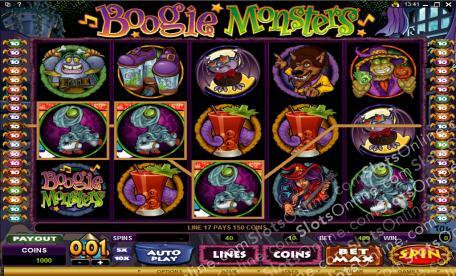 While every monster is doing its thing on the dance floor, you would do well to look around the Boogie Mansion. Everyone knows that monsters are known to horde gold and jewels. Who'd notice if you just took a few souvenirs of your time with the Boogie Monsters? The party started at midnight and is set to end at dawn. You'll have to hurry if you are to find the piles of treasure that are bound to be kept by the coolest Boogie Monsters in town. Fat Bat symbols are scatter symbols and they award bonus money when 3 or more are onscreen. 3 payout twice the total bet, 4 payout 10 times the total bet, and 5 payout 100 times the total bet. On free spins, they payout even better, at up to 200 times the total bet for 5 Fat Bats. In addition to the Fat Bat symbols, Potion Claw symbols also act as scatter symbols, but they provide 13 free spins at a 5 times multiplier in addition to the standard payouts for scatter wins. Scatter symbols must be on adjacent reels in order to count for wins.